Civil aviation was the child of late 19th Century engineering, brought to maturity by the fruits of the 20th Century technology. It has changed the world we live live in at at an awesome rate. The engineers who developed the internal combustion engine made air travel possible. The men who used it to pull aerofoils through the air and so lift airframe and engine from the ground made it a reality. Qantas has lived through all these changes from its beginnings and is the second oldest airline in the world. The Dutch airline KLM which began in 1919 is the oldest. When the infant Qantas company was registered in November 1920, with it headquarters in Queensland country town if Winton, residents from Darwin, the capital of the neighbouring Northern Territory, had two options if they wanted to leave. One was to catch the monthly boat, which had to round Cape York and pass down through the waters of the great Barrier Reef; the other was a precarious overland route, south to Adelaide, part of which was made by horse or camel. Animal power was still part of the technology of travel. Orville and Wilbur Wright had made the world's first controlled and sustained flight by power driven, heavier than air machine in 1903. The flight lasted 12 seconds but those seconds change life forever the possibilities for travel. Louise Bleriot flew across the English Channel in 1909. Near Adelaide, South Australia in 1910, F. C Custance used a Bleriot aircraft to make the first controlled, powered flight in Australia. Only a decade later, Qantas become into being. Enormous strides in aviation technology had been made in that decade, driven mainly by military requirements in World War 1. One year after the war ended, and only 10 years after Bleriot's Channel crossing, Ross and Keith Smith flew Vickers Vimy aircraft, powered by two Rolls Royce engines, across the world to Australia. It took them 28 days. Only 15 more years were to pass before regular passenger airline services were operating between the tow countries with Qantas flying between Australia and Singapore and Britain's Imperial Airways connecting at Singapore for the link to London. The first Qantas aircraft was much used Avro 504K biplane, a military trainer, modified in Australia to take a water cooled Sunbeam Dyak six cylinder engine of 100 horse power. It had fabric covered, wooden structure, was just under 29 feet long and carry a pilot and two passengers at a cruising speed of 65 miles per hour. It cost £1500. In mid 1921 Qantas moved its office to Duck Street in the outback of Queensland township of Longreach. The building was owned by local stock and station agent Frank Corey, who became the company's' fist secretary. This remained head office until Qantas moved to Brisbane in 1929. As this move took place, Mc Master reported to shareholders that McGuiness had flown 7400 miles in the Avro, had been in the air for 111 hours, made 130 landings and carried 285 passengers. exclusive of the pilot's salary, it has cost 48 shillings per hour to keep the aircraft aloft, or eight and half pence a mile. Fysh, in the BE2E, has already earned a gross return equal to double the purchase price of the aircraft. He had flown 6370 miles, been airborne 98 hours and carried 296 passengers. The Avro had averaged 67 miles per hour, the BE2E 65 miles. The fledging company now set out to get a government subsidy for regular air route or a mail contract. Frank Corey urged his chairman to buy a filing cabinet for £4.10 and also to get a cheque book "properly printed with the company's name". The Avro took of from Queensland from Sydney for Winton, in Western Queensland, on the first flight by a Qantas owned aircraft on 25th January 1921. At the controls was one of the three founders of Qantas, former war time pilot Paul McGuiness. Hudson Fysh (observer to Mc Guinness in World War 1) flew the second aircraft, a BE2E biplane. The BE2E had been owned by a stock and station agent but he became airsick on his first flight and sold the plane to Qantas . The BE2E could carry only one passenger plus the pilot. Awaiting their arrival in Queensland was grazier Fergus Mc Master, a man of great integrity and strength, was to remain chairman until after World War 11: Fysh was to serve Qantas for more than 40 years and live to see jet airliners circle the globe. McGuiness restless and adventurous, left after the first scheduled flight in 1922. There was a party in a smoke filled room in the North Gregory Hotel in Winton on the day of their arrival. Mc Master, who had a resounding voice and noble presence, declared "This commercial aviation company should get your support as Australians, not investors; not for dividends it is likely to bring in, but for the great influence it must have in thee administration, development and defense of Australia. "Mc Master realism never faltered and has remained integral to the Qantas tradition. The airline's goals have always been national as well as commercial. Technology has always driven aviation. The early outback operations of Qantas in western Queensland depended on unsuitable and unreliable ex-war aircraft. Engineer Jack Hazlett, who flew on the first scheduled Qantas passenger flight in 1922, described the as "beaten up old Armstrong Whitworths and their most unsuitable engines, with tiny little radiators built for cold climates", forced landing, on isolated cattle stations, we re common. Engine changes were carried out in open paddocks. The first aircraft built specifically of commercial use to be considered by Qantas was farcical failure. It was officially called the Vickers Vulcan and unofficially, the ' Flying Pig'. It looked like one. Internally it was flying palace for its day, a splendour of dove grey upholstery, hat racks and satin braid. It had -like a pig - a massive body volume and short undercarriage; its shaped more nearly resembled a massive pear. It was swollen monstrously as its for-end, where there was a dainty propeller and tiny enclosed engine, and it tapered at the other extremity to almost nothing. The Australian Government tried to force this aircraft on Qantas (to please Britain) and the test pilot, Geoffrey Wigglesworth, who brought it to Queensland for demonstration, was the quintessential English eccentric. Australian aviation pioneer Horrie Miller said: "He was afraid of nothing and nobody. He neither boasted nor bluffed." On the vending of his arrival at Longreach, after working on the aircraft for some hours, Wigglesworth grease covered and dirty, entered the town's bar and surveyed the assembly the with open contempt,: What," he roared "are all of you convict bastards drinking" Neither the man nor the question were considered in the least offensive. His audience was as tough as he was. All named their drinks quietly . The aircraft failed it performance tests in the hot air above Longreach. Wigglesworth, who wore carpet slippers for the flight, was unmoved. Mc Master wrote later: Whenever we looked down our eyes were attracted either to the hospital or the cemetery." In fact, the Vulcan was the first of along line of aircraft that Australian governments tried to impose on Qantas. Qantas was always to fly with an army of bureaucrats hanging onto its tail. Aircraft and engines design, however, improved over the years. One important British aircraft that was to play a big role not in Qantas operations by in civil aviation in Australia generally was the DH50. It had its official trails in England in November 1923. With 230 horsepower Siddeley Puma engine it had besides the pilot, usable load of 982 lbs - or a passenger capacity of four. The climb rate from the ground in good conditions was 600 feet a minute and it had a speed of 102 miles per hour at fill throttle. Take off distance, important to a Qantas operating from primitive air fields, was 180 yards and its range, fully loaded was 375 miles. It was the first aeroplane specifically built by Australian airlines and had a genuine passenger cabin. Qantas made a big step forward in 1929, "the biggest step in the welfare of Qantas since the commencement of the original mail route from Charleville to Cloncurry", wrote Mc Master. It began its first service to capital city. On 17th April, a route from Brisbane to Charleville was inaugurated, using new DH61 airliner. One passenger was the white beared grazier Alexander Kennedy (then 91) who had been the first paying Qantas passenger in 1922 . One spectacular technological advance was the provision of the first in flight lavatory. The era of sprinting for a little time shed after landing was coming to close. The DH61 had Juniper engines and could carry eight passengers in tis cabin. but the pilot still sat in open cockpit, behind the passenger area. One year later , in 1930, Qantas shifted it operational and managerial centre from country to city, a move that would critically influence its failure. The directors resolved that the office of the company be established in Brisbane, l and tenders were called to build a hangar at Archerfield aerodrome. When the move took place in June, Qantas had just completed one million miles of flying. It still has mixed bag of aircraft. There were two DH61s, two DH50s, for DH50As (with Puma engines), a single seat Gipsy Moth and two seat Puss Moths. The DH50s had all been built in the Qantas workshops at Longreach, a mighty achievement by Qantas chief engineer Arthur Baird. In 1932, Fergus Mc Master declared that Qantas should establish formal links with Britain's Imperial Airways withe hope of operating :any section of the Imperial route between England and Australia. The Qantas board, he said, recognised that " the imperial link is nota commercial concern". Personally, he said " I am keen upon the Imperial mail for national reason." Battlelines formed among competing Australian airlines to share in the air route that, it was now clear would soon join Australia and the Old World. A three year war of nerves and maneuvering began for the rich overseas mail contract. Qantas won that battle. On February 26th 1935, at Fanny Bay aerodrome in Darwin (where Fysh had greeted the Vimy in 1919). Hudson Fysh, one the three founders of Qantas, was at Fanny Bay aerodrome, Darwin, on 10th December 1919 to welcome the first flight from England to Australia. In fact, Fysh had chosen the site for the aerodrome, two miles north of Darwin and some 440 yards from the shore. A run of 800 yards, he informed the government, was possible to the north west, "The present obstructions, which are being cleared, are 700 yards of wire fencing, two banyan tress two large earth mounds and several small trees on the edge of the site," he wrote.. This was Australia's first International airport. That pioneering flight, by Ross and Keith Smith in Vickers Vimy, had taken off from Houndslow in England on 12th November. It covered 11. 550 miles in 135 hours 50 minutes over a period of 27 days 20 hours. It won the pilots a £10.000 prize from the Australian government and knighthoods. It also had direct link with the founding of Qantas. Fysh and his war time colleague, Paul McGuiness, had been commissioned by the Government to survey an aerial route from Darwin southwards across to Australia for the last legs of the flight. The survey had taken them through the Gulf country and Queensland's north, where Mc Guinness had the idea of linking their railheads (which ran inland from the east coast but were unconnected) by air. He persuaded a Queensland grazier Fergus Mc Master, to back his scheme. These three men- Mc Guinness, Fysh and Mc Master - started the little Queensland company that grew in to Australia's first international airline. Captain Scottie Allan lined up the DH86 airliner RMA Canberra for take off in the early morning light. It four engines would up to full take off power and the aircraft accelerated down the grass. Moments later it lifted off on the first overseas departure from Australia of a Qantas flight. Qantas had achieved it vision of spanning oceans, Qantas was to fly the 4000 mile section between Australian and Singapore; Imperial Airways was to fly the 8000 miles from Singapore to London. The DH86 brought big advance in aviation technology for Qantas, although it was not nearly as revolutionary as new American aircraft built by Douglas. Its great merit, in Qantas view, was that it had four engines where as the DC3 had only two. Its handicap, said it critics, was that it flew at only 145 miles and hour while the Douglas machine could reach 200 miles per hour. Both Imperial Airways and Qantas insisted, however, on four engines for over the water flights. Powered by Gypsy V1 engines, the DH86 was a cabin biplane. Its 34 foot fuselage was an unobstructed plywood box with spruce stiffening and fabric outer covering. Its wings had a span of 64 feet six inches, with engines mounted on the lower wing. Empty weight was 6000 pounds and it could carry up to 10 passengers plus a crew of two. The DC3, an all metal aircraft, could carry 21 passengers, but in Qantas view, was designed primarily for operations across the American mainland. In the same year that is all began, as Qantas was digesting all the technological complexities of a new aircraft type and over water operations, the British pressed forcefully for the operation of large flying boats on the same route as part of grand Empire Air Mail Scheme to link the far flung outposts of imperial Britain. The British initiative was strongly opposed by the Australian Government but just as strongly supported by Fergus Mc Master. Flying boats, he insisted, would provide sounder commercial results than any other system operated by land planes. Flying boats won the day. At the beginning of 1937, the Australian Prime Minister, Joseph Lyons, announced that agreement had been reached with Britain on Empire Flying Boat and Air Mail Scheme. A seven day, twice weekly service was to operate between London and Sydney from January 1938. In fact, the first official flight to Australia of the Empire Air Mail Scheme left England on 28th July 1938, arriving at Rose Bay, Sydney on 6th August. The land plane service between Brisbane London ceased. Under the agreement with Imperial Airways, the flying boats operated as an integral fleet over the complete route from Sydney to Southampton but the crews of the two airlines flew only on their own sections (changing over at Singapore). The flying boats were majestic in their size and proportions and a mighty advance, in terms of comfort and cabin service, for passengers. Built by Short Brothers of Rochester, Kent, they had four Bristol and Pegasus radial engines of 920 horsepower mounted on their high wings, were metal covered and almost twice as long (at 88 feet) as the DH86s. Their wing span was 114 feet. These first boats could carry 15 passengers (in 1938), but later the passenger capacity increased to 29. There were two pilots and 3 cabin crew. Their main handicap was their speed; they cruised at 165 miles per hour, a modest advance on the speed of the DH86 land planes. Range with this payload was 760 miles. When the first Empire flying boat Challenger, with Scottie Allan in command for the Singapore- Australian sector, arrived at Darwin 0n 4th July 1938, the unromantic side of flying boat travel was vividly demonstrated. Because of arguments between Immigration and Custom officials, the crew and passengers were left for more than and hour in darkness, gale force winds and a heavy swell and some passengers were sea sick. The flying boat service between Australia and England under Britain's Empire Airmail Scheme was inaugurated when Camilla took off from Rose bay, Sydney on the 4th August 1938, watched by a crowd of more than 2000. Captain Lester Brain was in command and Camilla carried eight passengers, 265 pounds of freight and 207 pounds of mail. Facilities on the Qantas sector to Singapore were poor and when compared with those on Imperial Airways sector between Singapore and England. Fysh commented in 1938 "Inability to night fly and make up lost time is letting down the ret of the route. The company still largely operates under temporary and meagre facilities. Existing conditions of Koepang, Bima, Sourabaya and Batavia are inviting catastrophe and loss of life". But the 'Sydney Morning Herald' praised the airlines creditable record on the 10th March 1939. It wrote "Yesterday, the departure of the Capella signalled the 100th flying boat service to leave Sydney and the occasion provides and opportunity to commend the high standard of punctuality achieved by Qantas Empire Airways." When the short lived, romantic era of the flying boat service neared its end as war broke out in Europe, timetable regularity achieved by the big boats was on 94% and Qantas had maintained its international record of no injuries to passengers or flying staff. But there were compensations. The flying boats were spacious to a degree never experienced before. Hudson Fysh wrote: " Getting up out of his chair, a passenger could walk about and, if his seat was in the main cabin , stroll along to the smoking cabin for a smoke, stopping on the way at the promenade deck with its high handrail and windows at eye level, to gaze at the world outside, and at countryside or seas slipping away...On the promenade deck there was also a practical, usable space where quoits or clock golf were played." The meals were scrumptious, Grapefruit and cereals, egg and bacon, bread rolls with tea, coffee or cocoa for breakfast; the late roast mutton with peas and potatoes, or a choice of ham, pressed beef, or ox tongue with salad, followed by Peach Melba, a cherry flan, or cheese and fruit. Technological progress had also brought benefits for the inner man. Politically and financially it was the carriage of mail, not passengers, that sustained the early years of civil aviation. Just how important air mail had become was described vividly by Hudson Fysh when Qantas and Imperial Airways faced an unprecedented public demand as Christmas approached in 1938. It was he wrote, "almost a nightmare. nothing like it had ever been attempted before air mail history... thirty one flying boats, the Mercury seaplane and 33 land planes, a total of 65 aircraft, were engaged in England - Australia Air Service over the busy period. Forty two services were operated stripped of all passenger accommodation fittings, thus allowing an extra half ton of mail to be carried each trip." That Christmas challenge, as 1938 ended and war approached, reflected the great advances made by Australia as whole in civil aviation activities. Measured by the yardstick of airline route mileage, Australia now ranked seventh among the countries of the world. In total number of air miles flown by regular air transport companies was sixth. In world terms, in the previous decade air route mileage grew by 130% and miles flown by 200%. Australia in the pre war years was the most air minded nation in the world. The era of the great flying boats has always been remembered as aviation at its romantic. In fact, it was only a brief interlude in the progress of civil aviation. It came to an abrupt end with World War 2. The war years caused the rapid development of the large land plane, both as a bomber and transport. The war years nearly ended Qantas. In September 1939, when Hitler invaded Poland and Britain declared war on Germany, the flying boat services that crossed the world had been in operation for a little over a year. On it Singapore - Sydney section, Qantas had carried almost 500 passengers. In its first nine months of operation the flying boats had carried more than all the previous four years of land plane operations. Qantas, from a staff of three and its beginning, now employed 285 people. On December 1941, Japan attacked Pearl Harbour and the United States entered World War 11. In less than three months Singapore had fallen and Japanese forces were advancing on port Moresby and New Guinea. The fall of Singapore severed the air route to England, the route that was the very basis of Qantas operations. By May, 1942, Qantas had lost six Empire flying boats as a result of enemy action or related activates. It was an airline with neither a route nor fleet. Its remaining aircraft, however, continued their hazardous war time operations. The basis for what was to be a remarkable post-war re-emergence by Qantas as an international airline began in mid 1943. With Japanese forces still astride the route through Singapore, Qantas initiated the longest non stop regular passenger air service ever attempted. The route was from Perth, in Western Australia, to Ceylon - a distance of 3513 miles. Once again Australia was to be linked with air with England. The aircraft used (all supplied under lend-lease by the United States) were Catalina flying boats. They had average speed of only 127 miles an hour and miniscule payload of 1000 pounds, but their range was phenomenal. With Qantas crews and under Qantas management they initiated a weekly service in each direction over enemy patrolled sea areas in complete radio silence. The flight took some 30 hours (the longest recorded flight was 32 hours nine minutes). Crew and passengers saw the sun rise twice between take off and landing. Although the turbulent wartimes years were not part of airlines history proper, the wartime advance of aviation technology laid the basis for the post war advances in civil aviation. Unfortunately for Britain and Australia, most of the advances in transport aircraft were, under US-British agreements, made in the United states. The military guise, proved their worth. The graceful Lockheed Constellation - designed specifically as as pressurised civil airliner - was born. Qantas began its post war flights on the traditional Empire route in June 1945 using modified British Lancaster bombers. They were uncompetitive and utterly unsuited to their task. Powered by four Rolls Royce engines, these Lancastrians had a cruising speed of 235 miles an hour. " In no circumstances," wrote Fysh "can more than six passengers be carried (with five crew)." The trip took 63 hours. The only other aircraft a war weary England could offer for five years ahead were stop gap Avro York (another modified bomber), flying boats and the Tudor land plane - un pressurised and slow. Fysh wrote sadly: "As an operator with the strongest Empire Leanings we have always backed British aircraft (but) our general recommendation must be for the Lockheed Constellation." It was a decision that was strongly contested in Britain. The Australian Prime Minister Ben Chifley, supported Fysh and eventually Britain was also to order American aircraft. The war had been responsible for an undreamed of expansion in all technological aspects of aviation and a great proliferation of airfields, radio aids and air traffic control systems but it had been in the United States where the basis for the development of the civil airliner was laid . Two post war civil airliner types emerged that were to dominate the air routes: the Douglas DC4 and the Lockheed Constellation. For Qantas, the acquisition of the Constellation was by far its single most important post war decision, for it was to become the central factor in growth and development of the airline's commercial and operational expertise. In December 1947, the fist Qantas Constellations service took off for London from Sydney carrying 29 passengers and 2000 pounds of food parcels for Britain. It flew the 12.137 miles in just over 55 hours. Two nights were spent in the air and two on the ground (one at Singapore and one in Cairo), making the elapsed time just under four days. Within two weeks there were four Constellations in full operation. Qantas had now began its post war phase as a highly competitive, modern airline supreme on Kangaroo route until 1957, when BOAC introduced Bristol Britannia turbo prop airliners. The Constellation, in its various developments, was to serve Qantas until the arrival of the jet airliner. Beginning as the Lockheed L749, it could carry either 38 first class passengers or 60 tourist class passengers. It was powered by four Wright Cyclone radial engines, each of 2500 horsepower, and cruised at 300 miles per hour. It was just over 95 feet long, was of aluminum alloy construction and had crew of 10. The later L1049 Super Constellation was about 10 feet longer and 35 miles an hour faster.. While this modern pressurised and fast airliner gave Qantas dominance on its traditional route to England, it also inaugurated the airline's single most important route expansion. In May 1954, Qantas began a big thrust eastward across the Pacific when it began service between Australia and the Unites States. That step brought the possibility of achieving the airline's vision for round the world services as Australian "chosen Instrument' in international aviation. in 1954, 34 years after Mc Guinness and Fysh had first met Fergus Mc Master in hotel in Brisbane to persuade him to back their plans for airline service, the airline they created flew to the United Kingdom, Hong Kong, Japan, and South Africa well as New Caledonia and the New Hebrides. Qantas Empire Airways, as it was then, earned more than £13 million a year, carried more than 118.000 passengers a year, employed 5000 people and reflected, in it relationships with other countries, the Australian national interest. Mc Master and Mc Guinness had both died: Fysh was the only surviving founder. In March 1954 he was knighted for his loyal, diligent and tenacious years of service. Aviation technology was now in its most dramatic phase. All new airliners offered from now on were based on the gas turbine engine and their variety was bewildering. Those with pure jet propulsion were Douglas DC8, the Boeing 707, the de Havilland Comet 1V (the Comet 1 had been a tragic failure) and the short range French Caravelle. The turbo props (using gas turbine engine and propeller) included the Lockheed Electra, the Bristol Britannia, the Vickers Vanguard and the short range Vickers Viscount. Qantas had new choices to stay competitive. In the closing months of 1955 the world airline industry gathered itself for dramatic and concerted rush into the jet era, sparked by a massive Pan American Airways order for 20 Boeing 707s. The world's airlines were on the brink of a revolution that would change the ravel pattens of hundreds of millions of people. Once again Qantas was to chose American. On 6th September 1956, the Australian Government announced its approval for the purchase by Qantas of seven Boeing 707-138 jet aircraft. The first of the Qantas 707s arrived in Sydney in July 1959. Although in range and payload the Boeings hardly differed from their fleet of Lockheed L1049z, their cursing speed was double that of the Lockheed. Further, while the piston engine Constellation cruised at 20.000 feet - where clouds and turbulence were constant handicaps - the 707 cruised above most of the weather at more than 35.00 feet. (Qantas also took delivery of Lockheed Electra turbo prop airliners for its shorter routes in late 1959. This quantum forward step in aircraft performance demonstrated vividly that its has always been aero engine development that has made progress possible in airliner development. The pure jet engine that so advanced the reach and speed of civil airliners was itself soon massively modified to add economy to speed. In the pure jet engine, air was drawn into the front, burnt with fuel and propelled at high speed from the back of the engine. In essence, it provided a small area of very high speed gases to drive the aircraft and was inefficient in terms of fuel consumption. Almost as Soon as Qantas received its first 707s it assessed the advantages of a modification to this arrangement, variously called the bypass engine and the fan jet. In this new arrangement, a large fan in the front section of the engine drove air, as before, through the burning chambers; but it drove an even larger volume of air around the heart of the engine to join the hot exhaust gases as the rear before emerging to provide thrust was far more economical in fuel consumption. It was on this technology that jet powered airliners now depended to hold down costs and provide the basis for future air travel. The fan jet was the key that made the travel habits of the rich available to the many. Qantas we at the forefront of the world's airlines in adopting this critical innovation, it first fan engine 707 (designed a 707-138B) reached Sydney in August 1961. All the older 707-138As had been modified by January 1962. It was the same month that new and extraordinary push began, by a joint Anglo-French consortium, to extend dramatically the horizons of civil airliner technology. A new airliner, the Concorde, that would fly more than twice the speed of sound, was proposed. The Concorde, although carefully evaluated by Qantas over the years of it development, was never to become part of the Qantas story. A relative small airliner, with restricted range and powered by fuel hungry pure jet engines, it magnificently fulfilled it technical promise; but it was never to be a commercial proposition for Qantas. Economics apart, range was always a key factor in Qantas aircraft choice and Concorde fell far short of its needs. Twenty years after the end of World War 11 there was, through out the world, a total civil airliner fleet of almost 5000. Jets now provided more than 70% of airliner capacity (although not of aircraft numbers). In mid 1966 the last surviving founder of Qantas, Sir Hudson Fysh, retired. His career, and the airline he had helped to create, had spanned thew whole of the world civil aviation. At that same time the industry was facing a massive transition to new airliners that would dwarf existing 707s and DC8s. Being already had full sized wooded mock up of its 400 seat Boeing 747 and Pan American had already ordered 25 of them. Again it was engine technology that made this leap forward possible. The American company Pratt and Whiney offered Bowing an engine with more than 40.000 pounds of thrust, which had been developed originally for the military C5A Galaxy transport. The 747 was conceived around this mighty power plant. In June 1967, Qantas accepted proposals from Boeing for firm delivery dates for four Boeing 747s in late 1971. It was a commitment to new kind of international airline operation, in which the a mass from a huge and previously untapped market would replace the more sedate and personal approach. Two months alter change of different kind was announced of Empire links and sentiments between Britain and Australia was change to Qantas Empire Airways Limited to Qantas Airways Limited. On September 17th 1971, Qantas began its Boeing 747 operations on the service to Singapore, extending it to London in November. By now more than 200 747s from 29 customers. There were more than 200 DC10s on order from Douglas for 19 airlines. The air travellers world was being dramatically transformed. The 747 had more than two and half times the passenger productivity of the developed version of the 707 - the Boeing 707-338C - that formed the basis of the pre jumbo Qantas fleet. The world was flooded with new airliner capacity and , for the airline traveller, that meant an almost miraculous lowering of fare levels. Technology had enabled Qantas in half century , to go from a two passenger Avro 747, from air speeds 10 times this, from short country hops to transocean routes. For the next two decades it was the Boeing 747, as it was continually developed, that became the mainstay of Qantas operations. 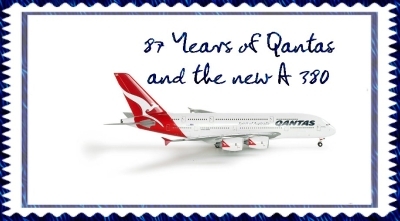 Perhaps the for the years ahead was indicated when Qantas, in August 1989, again showed that is pioneering instants were intact. Qantas Boeing 747-400 powered by Rolls Royce engines flew 18,.001 kilometres non-stop from London to Sydney - the longest ever single flight made by a civil airliner. Taken from Qantas 70th Year in 1990 INFLIGHT Book written by John Gunn.